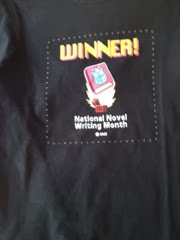 So as you can see, my winner shirt came today! I bought the hoodie,too. Why not? 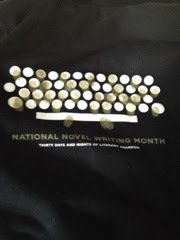 It's not often that writers get writing-related clothing, right? Yay! I get my shirt tomorrow!! I didn't get the hoodie. :( I'm not allowed. If you could see my closet you'd totally understand. Lol! I'm kind of obsessed with hoodies. I like this year's shirt design!